The Rankine earth pressure theory is extended herein to an inclined c–ϕ backfill. An analytical approach is then proposed to compute the static passive and active lateral earth pressures for a sloping cohesive backfill retained by a vertical wall, with the presence of wall–soil interface adhesion. The proposed method is based on a limit equilibrium analysis coupled with the method of slices wherein the assumed profile of the backfill failure surface is a composite of log-spiral and linear segments. The geometry of the failure surface is determined using the stress states of the soil at the two boundaries of the mobilized soil mass. The resultant lateral earth thrust, the point of application, and the induced moment on the wall are computed considering global and local equilibrium of forces and moments. 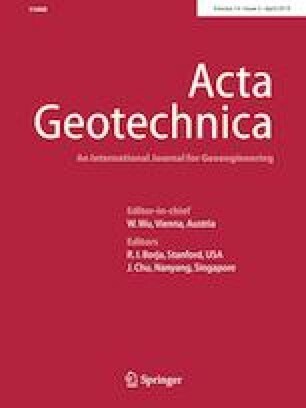 Results of the proposed approach are compared with those predicted by a number of analytical models currently adopted in the design practice for various combinations of soil’s frictional angles, wall–soil interface frictional angles, inclined angles of backfill and soil cohesions. The predicted results are also verified against those obtained from finite element analyses for several scenarios under the passive condition. It is found that the magnitude of earth thrust increases with the backfill inclination angle under both the passive and active conditions. The original version of this article was revised: the left-hand side of Eq. (8) had been mistakenly changed to σc instead of σx. Now, the equation has been corrected. The work presented in this paper was funded by City University of Hong Kong (CityU), HKSAR (Project No. : 7004375 (ACE) and 7200440 (ACE)) and by the California Department of Transportation (Grant No. 65A0582). The authors gratefully acknowledge the financial and technical support from these sources. Any opinions, findings and conclusions or recommendations expressed in this paper are those of the authors and do not necessarily reflect the views of CityU or Caltrans.